This guide has been produced by the Interlaken Group, with steering support from the Rights and Resources Initiative (RRI). The Interlaken Group is a multi-stakeholder forum composed of representatives from companies, investors, international organizations, and civil society groups. First convened in September 2013 during the International Conference on Scaling-Up Strategies to Secure Community Land and Resource Rights, the Interlaken Group has met regularly since then to identify practical ways in which companies and their investors can support improved land and forest governance and the tenure rights of rural populations. One outcome of their discussions was the recognition of the lack of clear, practical guidance for companies on the appropriate exercise of responsibilities in situations involving land acquisition processes to protect the tenure rights and livelihoods of existing rights-holders of land and forests. 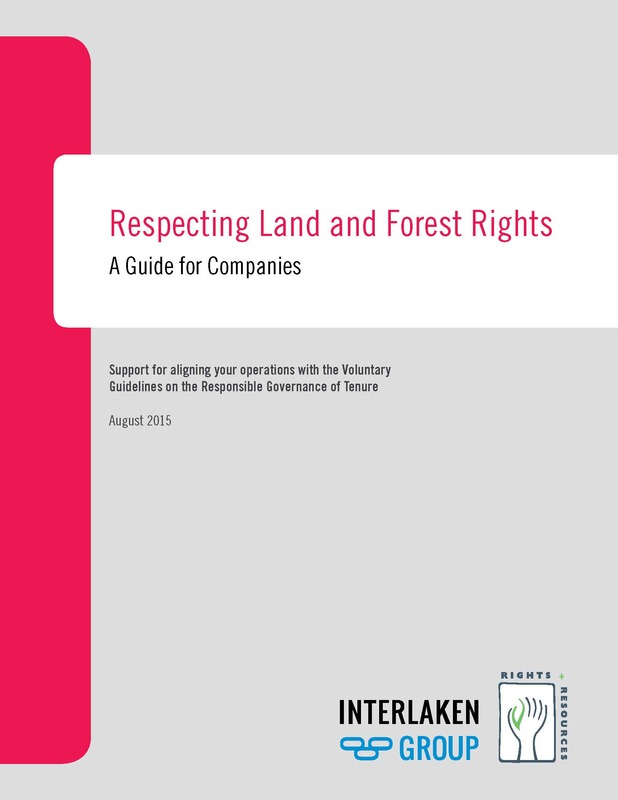 To this end, the Interlaken Group developed this Guide to support companies aiming to align their operations with the Voluntary Guidelines on the Responsible Governance of Tenure of Land, Fisheries and Forests in the Context of National Food Security (VGGT). The objective of this project is to formulate practical and detailed guidance for companies to help them do their part to respect local land and forest tenure rights. The guidance provided within is applicable across land-based sectors, with special emphasis given to agribusiness and plantation forestry operations to reflect the particular expertise of Interlaken Group members. The document also covers relevant information to ensure that legitimate tenure rights to natural forests are respected.